Lewis M. Terman, IEEE President, 2008, worked for IBM for forty-five years, and retired from the company’s research division in 2006. His research interests included solid-state circuits, semiconductor technology, and memory design and technology among other topics. Lewis Terman is the son of Frederick Terman, another prominent IEEE member, and Sibyl Walcutt Terman, an expert in the teaching of reading. He was named after his grandfather, a psycologist who developed the Stanford-Binet Intelligence Quotient. Terman was raised in California and remained there for his education. He received his B.S. in Physics and his M.S. and Ph.D. in electrical engineering from Stanford in 1956, 1958, and 1961, respectively. Terman then began a long relationship with IBM, starting work with the company in 1961. He retired from IBM’s Research Division in 2006 after forty-five years, and currently holds the title of IBM Research Emeritus. 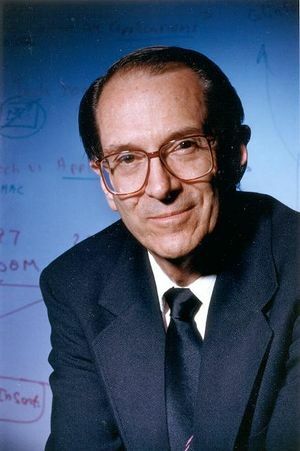 His past work focused on solid-state circuits, semiconductor technology, memory design and technology, digital and analog circuits and processor design. He received nine major IBM technical awards, including three corporate awards. Terman was elected to the IBM Academy of Technology in 1991, and served as president in 2001-2003. Terman is an IEEE Fellow and has been active as an IEEE volunteer and member for almost fifty years. He served as IEEE president in 2008. This page was last edited on 15 September 2017, at 02:30.